FRANK’S BIG AND TALL MEN’S CLOTHING is a long established specialty retailer (circa 1910 – see history below), focused on providing big and tall men’s clothing of high quality that will last, with attentive in-store service and free professional tailoring. Our goal is to help you look your best in clothing that is comfortable and affordable. If you are looking for the lowest price, we are not the place for you. If you are looking for big and tall men’s clothing of high quality, that will last and look best on you, then please come visit us. We have a large selection of famous maker Big and Tall pants, Big and Tall shirts, Big and Tall suits, Big and Tall ties and a whole lot more. Some of the areas famous Big & Tall athletes and other celebrities have been customers and become friends of ours over the years: Some of them include Lawrence Taylor (N.Y. Giants), Harry Carson (N.Y. Giants), Darryl Dawkins (Philadelphia 76ers & N.Y. Nets, a/k/a Chocolate Thunder- photo below), Johnny Cash (yes, THAT Johnny Cash- he was a pretty big dude and had ties to Asbury Park-photo below), Clarence Clemmons (of Bruce Springsteen’s E Street Band), Gorilla Monsoon (Pro Wrestler), D’Brickashaw Ferguson (N.Y. Jets All-Pro Lineman), Kelly Tripucka (Notre Dame, Denver Nuggets), Josh Jackson (4th Pick of the 2017 NBA draft – from Kansas Jayhawks-photo below), Bam Adebayo (14th Pick of the 2017 NBA draft – from Kentucky), to name a few. Any of the links below will bring you to our on-line shopping website for items you see here or the many other items that are not listed. You can access any category you wish from the site. If you don’t see what you’re looking for, please contact us. Due to the many sizes, brands and items we carry, not everything is listed on our website. Frank’s Big & Tall really started at the turn of the 20th century, approximately 1910, when our Grandfather Frank Marowitz, who had immigrated from the Ukraine region of the USSR, settled in with his wife Kate and opened shop in New Brunswick, New Jersey to provide for his young and growing family. Grandpa Frank did tailoring and also sold refurbished second hand clothing (the family lived above the store and the kids all helped out). He would uniquely tailor shirts and other clothing brought in by BIG & TALL men that could not find good fitting clothing off the shelf as he created quite a following. After they returned safely home from serving in the armed forces during World War II, three of his kids, Alex, Marty & Hy starting a Big & Tall specialty retail business aptly named, Frank’s Big & Tall. Hy was one of the founding fathers of the Big & Tall Men’s Buying Cooperative which enabled small retailers nationwide to pool their smaller orders of unique sizes and place orders with top name, quality manufacturers. Without this, the dramatic improvement in the clothing selection for big and tall guys would have never happened. For example, a small retailer couldn’t order 10 units of size 58 portly from Saint Laurent or the other famous makers, however, 500 stores ordering 10 units each could place an order of 5,000 suits as a group and have them made and delivered to their individual stores. This TOTALLY changed the industry! 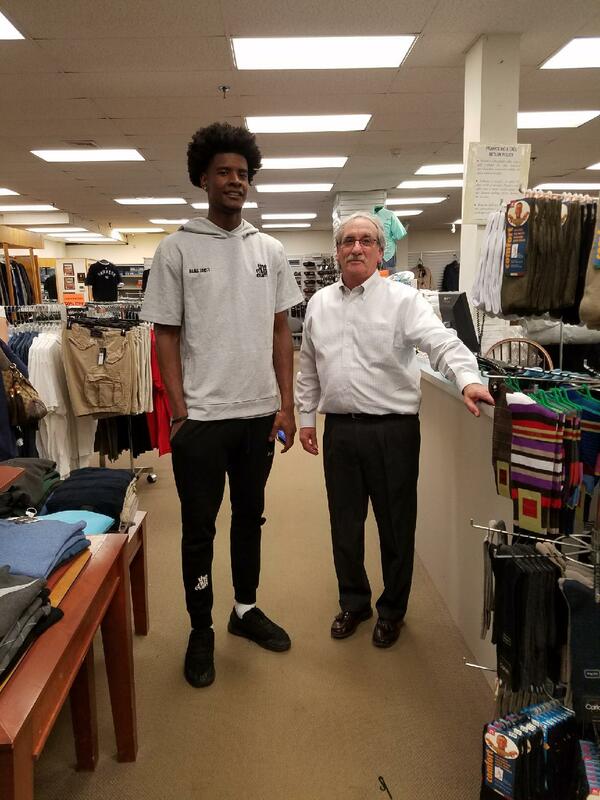 Frank’s Big & Tall has always focused on a wide array of top quality clothing selection and free tailoring to help our customers look their best. You will get the attentive service passed down from our Grandfather and we listen to you when you explain to us what you’re looking for. We are not a national chain and you will get decades of expertise handed down through the generations of our family in getting you to look your best. Come visit our Frank’s Big & Tall Men’s Clothing stores in Ocean Township, NJ, Morristown, NJ, and New Brunswick, NJ. Call us: 732-922-1525 or email us: info@franksbigandtall.com For all your Big & Tall clothing needs in Asbury Park!